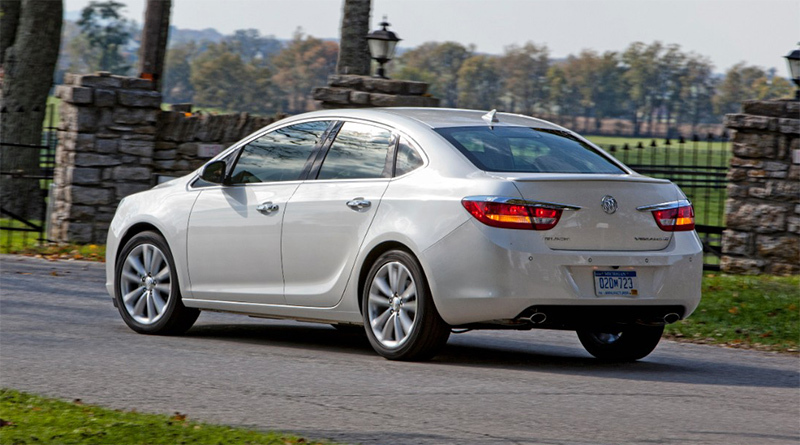 The 2015 Buick Verano is distinguished by thoughtful design, meticulous attention to detail, sculpted Buick brand cues and advanced interior acoustics, including Buick’s trademark QuietTuning – a combination that is winning over a new generation of customers. It delivers a premium level of equipment for the segment, such as a standard rearview camera, available heated steering wheel and soft-touch interior surfaces with world-class fit and finish. Those attributes have been recognized through awards and accolades such as Kelley Blue Book’s 2014 5-Year Cost to Own Award (entry-level luxury car segment), and it was named a Consumer Guide Best Buy for 2014. A new exterior color is offered for 2015: Dark Sapphire Blue Metallic; and a new appearance package is available for all models except the Turbo. It includes a rear spoiler and a silver/bright chrome grille. Strokes of chrome accent the car, along with signature features such as a black chrome waterfall grille and portholes. Blue translucent rings around the projector beam headlamp and chrome exhaust tip (dual exhaust outlets on 1ST) add to the sophistication and attention to detail. Heated outside mirrors are standard on 1SG, 1SL and 1ST and activate automatically with the remote starting feature at temperatures below 45 degrees F (7 C). Exterior colors include Summit White, Quicksilver Metallic, Mocha Bronze Metallic, Smoky Gray Metallic and Dark Sapphire Blue Metallic, along with premium colors Crystal Red Tintcoat, White Diamond Tricoat and Carbon Black Metallic (each available for an additional charge). Verano’s interior is marked by exceptional seat comfort and support, as well as premium, soft-touch materials. Metallic and wood trim accents and warm ambient lighting make the cabin an inviting environment. Cashmere and medium titanium colors are offered on interiors with leatherette/fabric seating surfaces, while Ebony and Cashmere colors are offered on the available leather interiors. Buick’s exclusive QuietTuning is designed to block or absorb sound and dampen or eliminate vibrations. It is included in every facet of the Verano’s architecture to make it the quietest compact sedan on the road and quieter than many midsize and full-size cars. Verano’s quiet cabin is supported with numerous features including acoustical laminated glass, triple door seals and refined chassis dynamics. Verano’s IntelliLink system is standard on all models and gives customers the best of both worlds when it comes to infotainment. It provides easy, intuitive operation of basic functions, yet it is also highly customizable and capable of linking up to 10 Bluetooth-connected devices such as smartphones and MP3 players, as well as USB drives, giving users more ways of staying connected. Enhanced connectivity and convenience include a new Text Messaging Alerts feature for smartphone users with Bluetooth profile (M.A.P. ), which reads incoming texts through the vehicle’s speakers, and Siri Eyes Free for iPhone iOS 6 and iOS 7 users to enhance connectivity and convenience. Each enables voice-controlled connectivity, to help keep phones safely stowed and hands on the wheel. In addition to icons covering everything from navigation to phone to music apps such as Pandora, IntelliLink is designed to accommodate new features and enhancements and be highly customizable. Its seven-inch-diagonal screen also serves as the display for the standard rearview camera system and available navigation system, as well as the controller for Verano’s audio system. Complementing IntelliLink to enhance Verano’s connectivity is new OnStar with 4G LTE and standard built-in Wi-Fi hotspot. It provides a mobile hub for drivers and passengers to stay connected – up to seven devices at once. The hotspot is on whenever the vehicle is on and comes with a three-month/three-gigabyte data trial, after which the customer can purchase additional data. Five years of OnStar Basic Plan includes RemoteLink Key Fob Services, allowing owners to remotely start and lock/unlock a car, and activate the horn and lights from anywhere with a data connection. It also includes OnStar Vehicle Diagnostics which runs monthly checks of a vehicle’s engine, transmission, anti-lock brakes and more, and Dealer Maintenance Notification, which sends a diagnostic report directly to a preferred dealer to simplify service scheduling. Verano is equipped with a choice of two four-cylinder engines: a standard Ecotec 2.4L and an available Ecotec 2.0L turbo. The Ecotec 2.0L turbo delivers 250 horsepower (187 kW) and 260 lb-ft of torque (353 Nm), providing on-demand power comparable to a V-6, but with the efficiency of a four-cylinder – and tuned to deliver unique performance, efficiency and quietness. Its development applied the best practices of technical centers in Europe and North America. 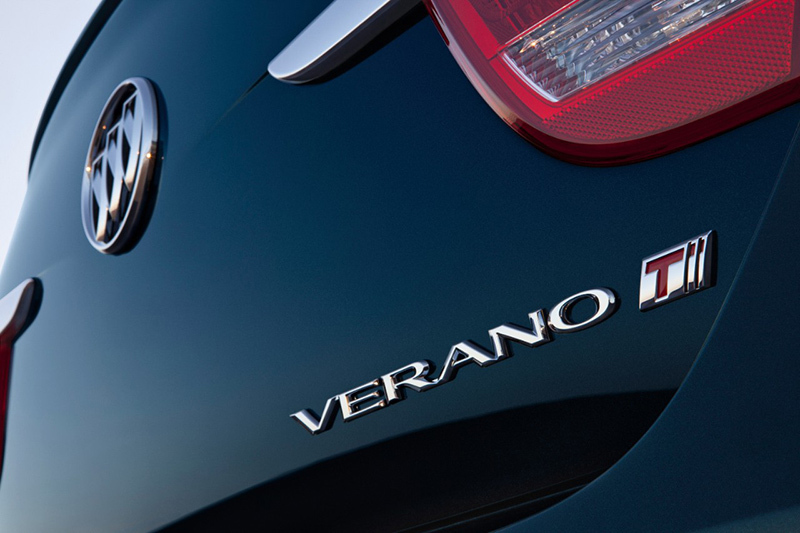 The Verano Turbo’s performance is matched with efficiency. It achieves EPA-estimated fuel economy of 21 city and 30 highway. Verano’s standard Ecotec 2.4L with direct-injection, dual-overhead camshafts and variable valve timing delivers responsive performance. Rated at 180 horsepower (134 kW) and 171 lb-ft of torque (232 Nm), it helps provide EPA-estimated highway fuel economy of 32 mpg. The Ecotec 2.4L is designed with features that reduce noise and improve its durability. Each piston has its own directed jet that sprays oil toward its skirt, coating its underside and the cylinder wall with an additional layer of lubricant. The extra lubrication cools the pistons, reducing friction and operational noise. A fuel-saving, six-speed automatic transmission with Driver Shift Control is matched with each engine. A six-speed manual transmission is available with the turbo. Verano’s refined, responsive suspension system includes decoupled MacPherson struts in the front that provide greater separation of extreme road conditions – large potholes, for example – from everyday driving conditions. A technically advanced Watts Z-link design helps center the rear axle during cornering, which helps keep the Verano’s handling responses symmetrical on both left-hand and right-hand turns. The linkage’s capability to center the axle during cornering delivers a more-balanced driving experience because the rear suspension better follows the lead of the front suspension. Steering inputs are executed by a fuel-saving electric power steering system, featuring a dual-pinion rack, while stopping power is handled by standard four-wheel disc brakes with anti-lock and Panic Brake Assist, develops additional brake pressure when an emergency braking situation is detected. Verano also is equipped with GM’s enhanced smart pedal brake override technology, which helps prevent unintended acceleration by reducing engine power when the brake and accelerator are depressed at the same time. Verano employs radar- and camera-based safety features with carefully developed directional alerts that help drivers quickly identify potential crash situations so they can react. Side blind zone alert and rear cross-traffic alert (standard on 1SG, 1SL and 1ST) helps avoid collisions by using radar to monitor areas the driver may not be able to see and provide alerts. Forward collision alert and lane departure warning use cameras to detect possible crash situations and alert the driver. Verano also features a strong, unitized body structure incorporating 60-percent high-strength steel in key areas to enhance strength and crash protection by helping to prevent intrusion into the passenger compartment.